To start the kneeling pushup on the ball, kneel in front of the ball and place your hands on the exercise ball about shoulder width apart. The further back you are from the ball, the more difficult this ball exercise will be. Before attempting to move, activate your abdominal muscles as you have learned in the other beginner exercise ball exercises. Lower your chest to the ball slowly. Slowly rise back up to the starting position. Maintain neutral spinal position throughout the exercise. Start slowly and be sure to maintain correct form at all times. Do not allow your hips to sag. If you feel your shoulder blades winging or moving up or forward you may need to work on your scapular stabilizers - try Static Leaning on your Knees and Leaning Straight first with the ball on the wall. Use a smaller ball. The more horizontal you are, the more difficult is the exercise. Start from a kneeling position further away from the ball. Add air to make your exercise ball firmer. As the ball wants to roll away it will demand more from you to keep it steady. Try Push ups on Ball with knees straight. If you are new to doing pushups or are just getting back into an exercise program after a period of being off the kneeling pushup on the ball is a good exercise with which to start. Once you've mastered the kneeling plank on the ball with arms straight you can introduce some movement. The kneeling pushup on the ball is really just a kneeling plank in motion. 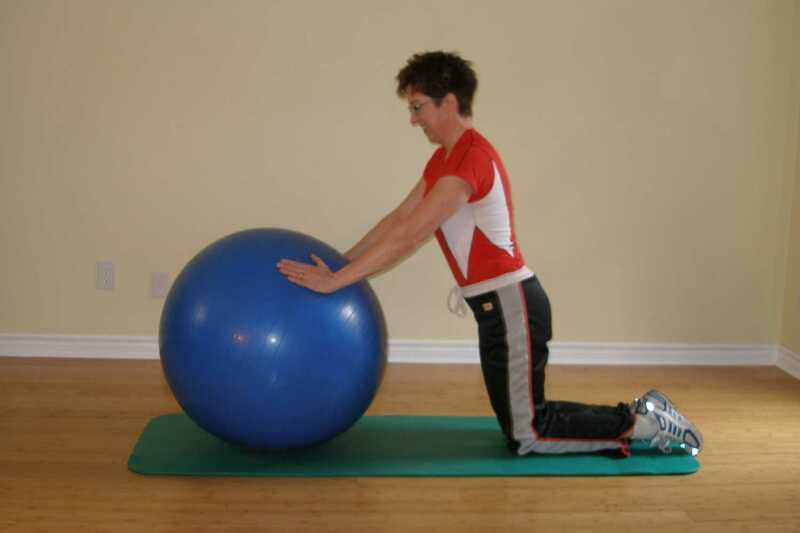 For your first attempt at this, prop your exercise ball into a corner to prevent it from rolling away. Once you get comfortable with this you can bring it away from the wall for a bit of a challenge.